For nearly all of the Great War, the Jewish doctor Bernhard Bardach served with the Austro-Hungarian army in present-day Ukraine. His diaries from that period, unpublished and largely overlooked until now, represent a distinctive and powerful record of daily life on the Eastern Front. 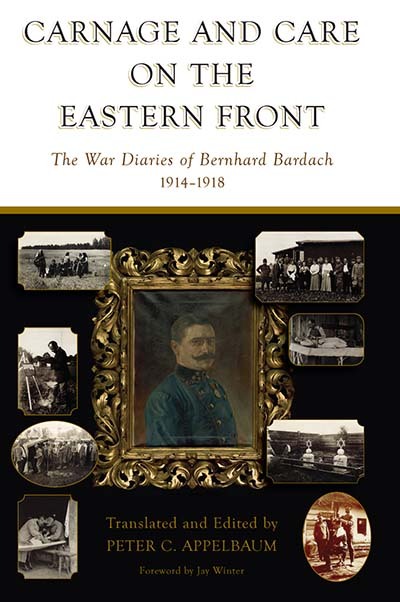 In addition to key events such as the 1916 Brusilov Offensive, Bardach also gives memorable descriptions of military personalities, refugees, food shortages, and the uncertainty and boredom that inescapably attended life on the front. Ranging from the critical first weeks of fighting to the ultimate collapse of the Austrian army, these meticulously written diaries comprise an invaluable eyewitness account of the Great War. Peter C. Appelbaum is an Emeritus Professor of Pathology, Pennsylvania State University. His publications include the books Loyalty Betrayed: Jewish Chaplains in the German Army During the First World War and Loyal Sons: Jews in the German Army in the Great War (both 2014) and, as translator and editor, Broken Carousel: German Jewish Soldier-Poets of the Great War (2017), Jewish Tales of the Great War (2017), Avigdor Hameiri’s Hell on Earth (2017), and Kurt Tucholsky’s Prayer after the Slaughter (2015).